My love for the equine family was an affair that lasted through over thirty years and five horses of my own. The four legged horses were replaced by mechanical “ponies” (mountain bikes and motorcycles) when urban horses became a luxury. 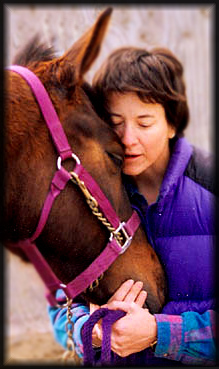 Working with horses and other animals kept me out of trouble growing up, and wanting to celebrate the sensitivity and intelligence of that kindred mind behind their eyes is the biggest influence on my creativity. To me all true art is a pure celebration. My first sale of my first bronze sculpture was through a respected gallery in the old renowned Huntington Sheraton Hotel in Pasadena, California, and soon after was a sale of my second bronze of a trotting horse that was bought and donated as a perpetual trophy to the Los Angeles County Horse Show Exhibitors Association, both when I was 16. I continued working in bronze and oil painting through my college years, and did a number of commissioned portraits. I received my BFA in Fine Art. After college I spent most of my creative time working in bronze sculpture, with an emphasis on wildlife and horses. I did much of the work involved in the casting process myself, including making molds and pouring the patterns, retouching and finish chasing and patinas, all with careful attention to fine detail. I also continued painting in oil and acrylic, taking more commissions and selling too much of my work without recording it. I did commissions in clay, modeling all kinds of animal art from dinosaurs to big cats, and a few small odd or hilarious requests including a "Banana Man" and matching "Bananamobile" for Ken Bannister, a local enthusiast and President of The Banana Club. I did reconstruction of Egyptian artifacts for one client, sculpted muscle cars for another, did the basic design work and concept art for Mattel’s "My Little Pony" toy for a lazy friend who had the actual assignment, and I had previously turned down a job offer from Mattel to sculpt doll heads. Ah, irony. I then moved sideways for 20 years into a catchall business of coins, stamps, antiques and collectibles; and though it impacted my creative time, I did some of my best work during those years. I had my pieces in juried invitational only shows across the West, many as a repeat exhibitor, including in California the Hillcrest Festival of Fine Arts, the Beverly Hills Affaire In The Gardens, the Descanso Gardens Art Shows, and the La Quinta Arts Festival; also the George Phippen Memorial Show in Prescott, Arizona; the Sculpture In The Park show in Loveland, Colorado, and the American Academy of Equine Art show at the Kentucky Derby Museum. I was a founding member of the California Sculptor's Alliance in the late 1980s. My husband and I were avid collectors of Northwest Coast Indian art, and I spent some time studying Haida form line structure and art history. I met Bill Holm (at that time Curator Emeritus of the Burke Museum at the University of Washington in Seattle) on several occasions, and after one visit to our store to see what was new in our collection after giving a talk at the Southwest Museum, he came by our and gave me a 3 hour crash course from a master in form line rules. The resulting inspiration was displayed in a full sized dance button blanket I made by hand from my own designs, which the Southwest Museum asked to borrow for exhibit alongside real historical examples in their Northwest collections rooms. For years I had bronzes and some paintings in galleries on the West Coast and in Arizona, Nevada, Florida and Hawaii. I spent several more years working full time in art related fields. One position was mold maker and retoucher at an art bronze casting foundry, handling original works of top Cowboy Artists from all over the West, which I felt quite a privilege. I later sold world tribal art in a gallery in Pasadena and also did studio work for a company that did spec work for Disney. It's said that a smooth, easy road isn't much of a teacher. There's no glory in always taking the easy path, nor the hardest, and I look for the Buddha's middle way. The accessibility offered by the internet as an occasional self representing artist allows me to offer pieces directly to an interested collector. I am well aware that the "art world" has many definitions of what art is; as I noted above I personally see art in its finest and truest forms as pure celebration. I feel from my own perspective that the “best” art is what speaks to you.touches your heart.